Follow the Wabbit: The Wabbit sends an Alert! "The Wabbit calling Franco, do you copy?" said the Wabbit. "There's no need for that, Wabbit, it’s a telephone," replied Franco as he swerved around a barrier. "Oh really, how disappointing," said the Wabbit. "What can I do for you Wabbit?" said Franco, ducking under another barrier. "Be on the lookout for a strange helichopper," said the Wabbit. "I clocked him, he’s at three o’clock," said Franco. "Did he spot you?" asked the Wabbit. "Yes, but I lost him," said Franco, "I swerved into an underground car park the wrong way." "Where are you now?" asked the Wabbit. "Coming out of the underground car park," said Franco. "The wrong way?" said the Wabbit. "It's possible," said Franco. "Do you think it's the Agents of Rabit helichopper?" said the Wabbit. "It hovers like a ghetto bird," said Franco. "That's their style," said the Wabbit. 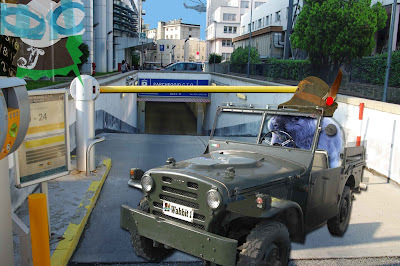 For a while, there was silence from Franco and the Wabbit heard a series of swerving noises. "Sorry Sir, I hit some cardboard boxes," said Franco. "Pay no attention," said the Wabbit and flinched at a loud bang. "What was that Franco?" asked the Wabbit. "A news vendor stand," shouted Franco and he whooped. "Pay no attention," said the Wabbit. Suddenly, there was a piercing scream of sirens and the Wabbit asked again what was happening. "I'm in the slipstream of a fire engine," said Franco. "Excellent!" said the Wabbit.